Successful open field crop production depends on good weed management practices. Controlling weeds forms part of the total crop management program which includes other activities such as pest and disease management and general hygiene. The planning of a weed management control program is much easier than planning pest and disease management programs. The reasons are that pests and diseases are sporadic while weed populations are relatively constant. The basic weed management practices are: prevention, control and eradication. As soon as weeds which are growing in a field are allowed to grow into the reproductive phase the battle to control them is already lost. It is critical that this stage is never reached so that the population can decrease over a period of years. The same can be applied to weeds that reproduce vegetatively. The grower has to determine to what extent new weeds should be limited. Ensuring 100 % is often unfeasible under commercial farming conditions since it is very expensive and time consuming. The ideal is to achieve a stable situation where the amount of new weeds introduced are limited without spending large amounts of time and money in comparison with the income generated from the land. Controlling weeds requires actions that will reduce the weed population over time to such an extent that they will not interfere with commercial plants. Weeds in fields are usually controlled to levels that it will not interfere with crop growth and harvesting practices. As with prevention, the level of control will depend on the value of the crop planted and the cost of controlling weed populations. Eradication is the complete eradication of weeds or a weed specie from an area. Eradication involves the removal of all parts of a weed which as the potential to grow. Thus all living parts, all seeds and any vegetative part must be eradicated from the land. Eradication is the most expensive method of weed control. Eradication is rarely applied on large pieces of land which also makes to extremely expensive. In most cases, growers try to eradicate a specific type of weed such as Cyperus esculentus L. (Yellow nutsedge, Yellow nutgrass or Watergrass), Cyperus rotundus L. (Purple nutsedge, Red nutgrass). Eradication methods are often applied in composts and other small amounts of soil which are used in intensive crop production. The most common method used is heat sterilization through either steam or allowing a compost heap heat up naturally to at least 80 °C over a period of 72 hours. This will ensure that most of the weed seed and any vegetative material is killed. An expensive method is fumigation using Methyl Bromide, Fusillade and EDB. Just as weeds can reduce the growth of commercial crops, the grower can schedule the planting of his crop so that when the weeds emerge, they are too small to compete with the crop. This requires some knowledge of the weed spectrum during the year as well as climatic variations. By planting the commercial crop at least on month before most weeds emerging will give the grower the advantage. 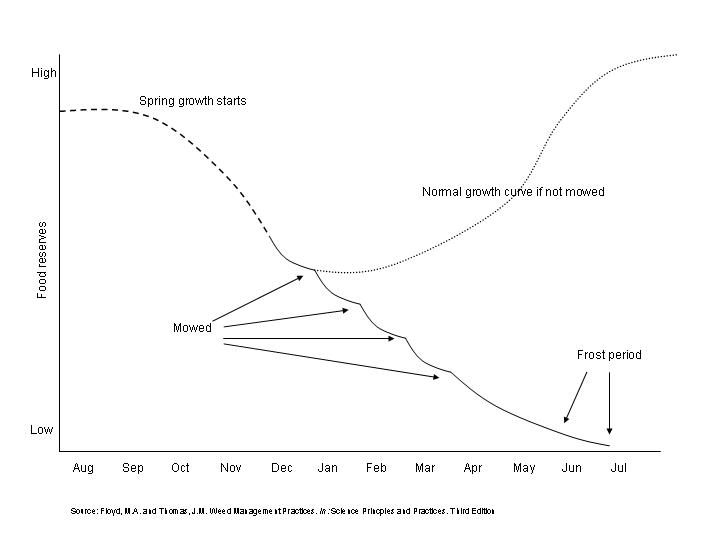 However, by planting earlier, especially in spring, the grower increases the risk of frost damage. Other practises to increase the competition factor is to increase the planting density of the commercial crop making it difficult for the weed to compete since it is outnumbered. Foster crops are often used to compete with weeds and weaken their growth and their competitive ability. By the time the commercial crop is planted, the weeds has lost its growth potential and competitiveness. Inter cropping and crop rotation principles have been implemented for many years, not just to obtain advantages in terms of pests and diseases, variety of produce etc., but also to control and limit the number of weeds that germinate throughout the year. Many growers plant a vegetable crop between fruit trees during periods when certain weeds are a problem. This ensures that land is used optimally and weeds are limited. The grower not only saves money by controlling the weeds but he is actually making money in the process. In the past few years the development of chemicals have advanced so far that some commercial crops are not sensitive to the herbicides but the weed is. This help the grower to control the weed chemically in the present of the crop. In a mono-culture production system which is applied over years a single weed may become the dominant weed which will be difficult to control. Each plant has its ideal environmental conditions in which it grows and the same applies to weeds. Some weeds are associated with some cropping systems. By changing the cropping system from time to time will disrupt the normal growth pattern of the weed and reduce its numbers significantly. A crop rotation system can only be successful if all the weeds are controlled in each cropping rotation. Total control is not possible but the development of a dominant weed will be prevented. The grower will find a more diverse population of weeds in his field but they will also be more controllable. The established crop has adapted to the environment and has a competitive edge as soon as the weeds start to germinate. However if the grower has applied herbicides before planting, the chemical have to stay in the soil for a longer period until the weeds start to germinate. By that time the effectiveness of the herbicides might have decreased significantly. The effectiveness of fertilizers to increase yields can be reduced by the presence of weeds which have a high consumption of nutrients if available. Many growers believe that by applying more fertilizers in order to compensate for the presence of weeds will cancel the negative effects of the weed on the crop, is not true. The weed will benefit more through the application of nutrients and make it a stronger competitor. The only time where the addition of fertilizers help is during the application of herbicides. If additional nitrogen is applied to the weed, the weed has a more luscious growth, with thinner leaf epidermis making the penetration of chemicals more effective. By changing the irrigation program can significantly help in controlling weed populations. For instance, replacing a flood irrigation or overhead irrigation system with a dripper system will control and limit weed populations in paths or between the crop rows. Using dripper system the grower has full control over the amount of water applied and time as well as the location. Each plant can receive just the right amounts of water every day and the water can be applied at the root system. Some growers have installed underground irrigation systems so that the surface of the soil only gets wet when it rains. Underground systems are only used in tree (citrus) orchards. The weed management method such as cultural, mechanical and biological and the combinations of the three methods. Quite often a grower would like to grow a certain crop but due to the high population of weeds and their specific growth patterns, certain crops cannot be grown, for instance, when high growing weeds are present such as certain Amaranth species, it would be unwise to grow lettuce or carrots which are not very good competitors and are low growing. The grower needs to bring the high growing or limiting weeds population down considerable before planting the required crop. In lands where there are high densities of weed seed, it is advisable to grow crops that have a high initial growth rate, are able to grow in high densities and grows higher that the average weed in the field. Varieties are mostly distinguished on their ability to resist pest and disease pressure, some varieties have a significantly stronger growth pattern than others. These varieties with stronger growth patterns should be selected in fields where weed populations have not stabilized or which are not under control. Controlling weeds through a tillage program can be very effective. This requires ploughing weeds into the soil just before the go into reproductive phase (producing seed). The initial tillage activity is called the primary tillage phase. The secondary tillage phase is applied a couple of weeks later by using a harrow or disc to cover the upcoming weeds with soil. Ensuring good control often requires at least three actions with some type of implement attached to a tractor. Tillage actions exposes vegetative parts and seeds of weeds to harsh conditions such as high temperatures, draught and freezing. It is especially effective which vegetative parts are exposed. Tillage actions often damage weed plants which makes them susceptible to many diseases which attacks the weakened plant. These plants have less resistance to high and low temperatures and often die quickly. Most perennial weeds are physically damaged by tillage actions. The whole idea of no-tillage is to reduce tractor movement over the land in order to reduce its negative influence on the soil structure and to reduce input costs. During no-tillage operations weeds are controlled chemically after which a no-till planter opens a narrow furrow in which the seed is placed. Conservation tillage, reduced tillage and minimum tillage are all terms commonly used to describe primary tillage systems between the extremes of conventional and no-tillage. Hand weeding was the first method that was applied to control weeds in commercial fields. Hand weeding implies the pulling and hoeing of weeds manually be hand or with a small implement. This method of control is time consuming and can be expensive depending on the cost of labour. Another disadvantage is the more movement between fields through either people of vehicles, the more is the chance that diseases can be spread. It is thus essential that movement between fields, especially if different crops are grown, be limited. Never allow agents, advisors or other farmers on your field without cleaning their shoes. They may have seeds of various weeds, bacteria and fungi nested in the soil of their shoes and can spread the diseases and weeds in your clean fields. It is well known that bacterial wilt can spread from land to land by human movement and there is no cure for the disease as yet. Continuous cutting of weeds depletes the energy of the plant to re-grow. If done repeatedly the plant has so little growth potential that it is attacked by various pests and microbes that it eventually dies. This method is only effective on high growing perennial weeds. The weeds should be “mowed” just before the go into seed production. The cutting action also forces the weeds to grow more side shoots which uses up energy and reduces their resistance to pest and disease attack. Mowing can favour smaller weeds bellow the cutting point and if not controlled can cause a shift in biotype from upright to more prostrate form (horizontal growth, bush growth). Mowing should be done repeatedly. Most weeds that have been mowed will develop side shoots and if stressed will produce seeds quickly in order to ensure the survival of their species. The grower must, after the first cutting, monitor the weeds and if side shoots develop, they should be mowed again. As soon as the lower parts of the plant start to get woody, side shoots will not develop and the plant roots will die of starvation. Most plants will die if their protoplasm reaches a temperature of 55 °C. One of the few plants that require such high temperatures in order to reproduce are the protected seeds of the Proteaceae spp. and of the Hakea spp. Heat treatment in the form of fire is seldom applied except in the Cape where the biodiversity of the Proteaceae spp. depends on fire. Heat treatment is only effective on the above ground organs of weeds. The underground organs are not affected so it is essential that the fire treatment should be repeated as soon as the organs or seed develop into young seedlings. Fire is probably the cheapest method of control on small areas, but it is also potentially very dangerous. An a large scale burning becomes very expensive and the risks far outweigh the advantages. 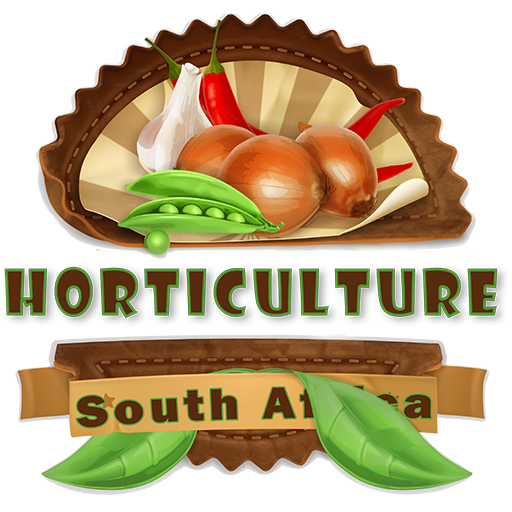 Heat in terms of steam is used extensively in the vegetable and seedling industry in order to sterilize the growth medium in which the plants are grown. 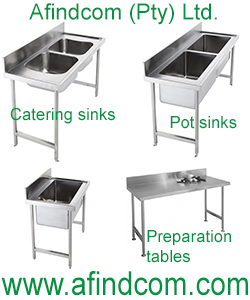 The advantage of steam sterilization is that many of the negative fungi and bacteria are also controlled. The use of flooding is only effective if the plants are covered completely (submersed) for a period of 3-8 weeks. This type of application does not render itself to be very popular in South Africa since our water sources are to precious to be wasted in such a way. 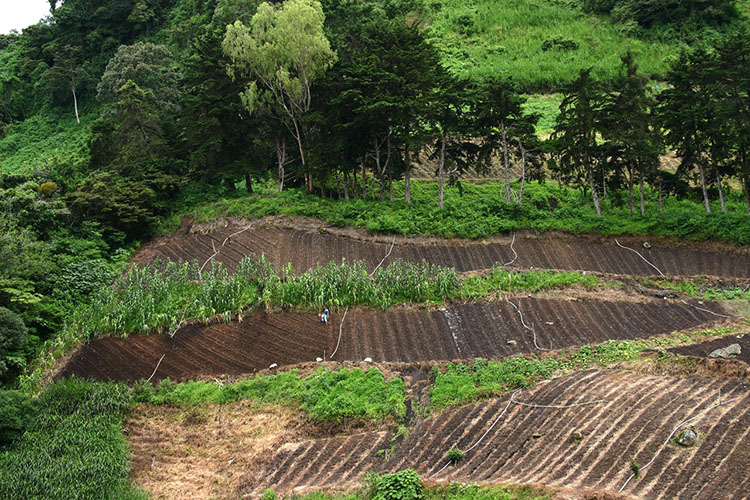 The use of water is applied in rice lands where expensive dykes are build in order to control the flow of the water. Mulches are often used in intensive vegetable production systems. Not only does it reduce the amount of weeds germinating or competing, it also reduces the cost of controlling the weeds. Plastic mulches are very cheap and they have other advantages such as increasing soil temperatures during early spring (brown plastic mulches), increasing the photosynthetic activity of leaves by reflecting sun light (white plastic mulches) and decreasing soil temperatures during hot seasons (black plastic mulches). Further advantages is the reduced water evaporation, so less water is applied through irrigation for the same amount of yield, and reduced pest and disease pressure on plants. Plastic mulches are only used in intensive vegetable production systems where plants are planted by hand and in rows. The increasing pressure for more ecologically friendly pest, disease and weed control methods makes biological control the way of the future. Biological control is based on the Elton principle which states that biological complexity ensures the stability of an eco-system. This implies that all organisms react to each other and compete with each other in such a way that the relative numbers of each specie stays constant. This principle functions in an environment which is undisturbed and stable. As soon as a piece of land is disturbed by either humans, such as ploughing or even a fire, the ecological balance is disturbed and it takes a while before all the relevant species are present to ensure ecological stability. It is evident that if a grower intends to apply biological weed control methods, he should have a sound understanding of all the living interactions in his area. The grower should have a good understanding of pathology, entomology, virology and agronomy. The reason is that all natural organisms have natural enemies (predators or pathogens) or specific environmental conditions which limits their numbers. Unfortunately not any organism can be used as a predator to control another organisms be it a plant or insect or disease. The main criteria for a predator in biological control is that the predator should be host specific, which means that it should not attack any other organism other than the specific one that is causing the problem. This rule should apply even if the host is not present. When a grower applies a biological control program, the effect of the program or the implementation of the predators that must control the weeds is not immediately. As can be seen in the figure below, the predator and host plant (the weed in this case) requires some time before a stable situation settles in. 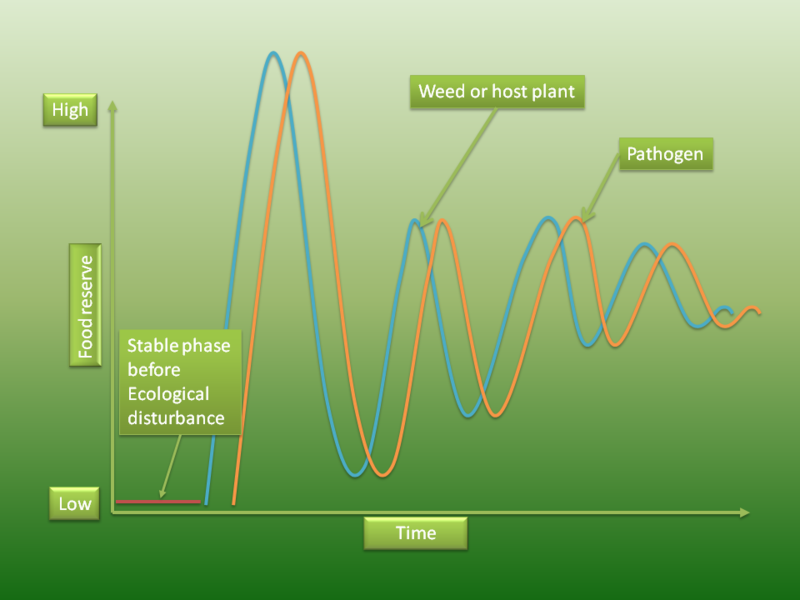 The process of determining the suitability of a weed to biological control is presented in the figure below. This process is important since the biological agent should only attack the targeted weed specie and no other plants, especially the commercial crop. 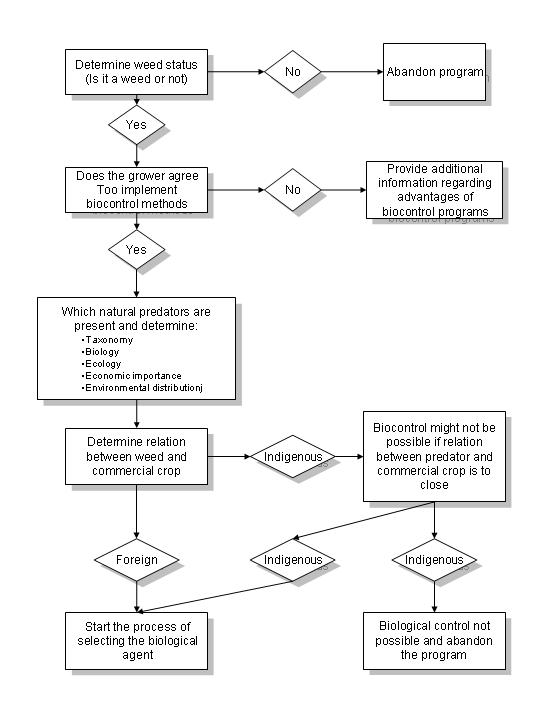 The process of determining the suitability of controlling a weed biologically. The process of determining an agent can take as long as 5 years since all possible reactions and effects on other organisms should be tested before releasing the biological agent. The biological agent should be able to reproduce quickly in order to control the weed. The biological agent should not have any other pests, diseases or viruses that can reduce its effectiveness in controlling the targeted weed. The biological control agent should not be too expensive. In most cases insects are used to control weeds, however, viruses are host specific and very safe to use but difficult to ensure good coverage if there are no insects to carry the virus. This applies when the weed grows in winter conditions when there are not that many insects. An easy method of biological control is using animals to graze the problem weed when it is young and succulent. Grazing should be applied before the weed starts too produce seed and before it grows to old and becomes unpalatable. Once a predator has been selected, the researchers should conduct stringent tests to ensure that the predator will only attack the weed and not any other ecological or commercial plants. As soon as the predator passes all these tests, the predators must be released into the fields where the problem occurs. Once the predator has been released, it is critical to monitor its effectiveness in order to determine when additional organisms should be released in order to have a consistent and even control throughout the period in which the weed is a problem. Insects are the most widely used bio-agent currently. The advantage is that they are host specific, very mobile which makes the control of a weed on a large area easy. Insects are also the host to many virus diseases which can spread very quickly. Cactoblastis cactorum (Moth borer) used to control Opuntia spp. (Cactus) in Australia. Hypericum perforatum (St. John’s Wort) controlled by Chrysolina spp. which is a leaf eating beetle. Pathogens which are used for controlling weeds biologically are mostly fungi and in some cases viruses. A self-maintaining plant pathogen is established at the inoculum level. This method is used on range lands, aquatic sites and non crop lands. A high level of disease inoculum is applied repeatedly over the area infected. This method is also called “mycoherbicide” and is applied extensively in citrus farms and rice fields. Animals used for controlling weeds are geese, goats, sheep and cattle. They have been used to control weeds in commercial crops, pastures and non crop lands. For instance sheep and goats can be used to consume broadleaf and other plants in order to avoid Senecio poisoning in cattle. Although biological control is the method of the future, there are advantages and disadvantages of the method. The ecosystem is not disturbed. If the problem is simple it is a relatively cheap method of weed control. Weeds can be control in areas which is difficult to come by with vehicles or aeroplanes. Biological control is never 100 % and the grower must accept that his yields will never reach the full potential, however, a decrease in control cost and increase in price obtained for his product should be realized. All weeds are attacked, even in areas where they are an advantage. Biological control cannot be implemented in all cases.